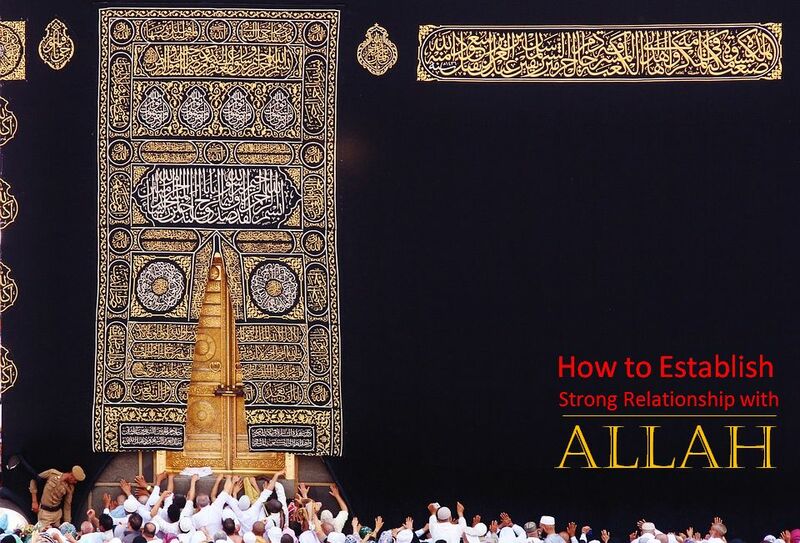 Why and How to Establish a Strong Relationship with Allah ~ Islam My Ultimate Decision . Man is not born in isolation, for living he has to have relationship with other around him. Thus we understand that relationship is the way in which two or more people or things are connected, or the state of being connected. We have our parents, the two most near and dear one who brought us into this world, raise and rear us and make us stand independently on our feet. Due to them, we also have the loving relation of brothers and sisters, uncles and cousins. Moving out of our closely bonded relation of family, we make friends, acquaintances or people we mere know them as they come by in our lives. In nutshell we cannot live an ideal life without being connected or related to others. For a life living all by itself may turn one into a lunatic or no man. Now if our relation with human beings is important, do we need to have a relation with Allah, God to some? There is a Deity which has created this fathomless universe with so many blessings so that we humans and animals could live with ease and happiness. A deficiency of any of these blessings could turn our lives into nightmares. If Allah has created everything for us, then we are obliged to connect to Him and establish a relationship that of a Deity or Lord and of a servant. There is no denying that "Allah is the only true Provider. It is He who has bestowed on man such faculties and capabilities as seeing, hearing, thinking and articulating-attributes which man cannot live without, but which he cannot create for himself. It is He who has made available the resources of the external world which man may discover, exploit and develop but, again, cannot create." In fact the world "Islam" means total submission to Allah. And this forms the basis of our relationship with Allah. As His subjects we have to submit faithfully and fully to His will and seek guidance as brought by His Prophets. But this submission must be total and all-embracing. A Muslim submits his entire ‘person’ to his Creator as his only Lord and Master. No part of his life can be exempt from the need of divine guidance or from the writ of divine sovereignty. One could go on and on to describe reasons to establish a connection to one's only Creator, a connection without which we can neither be a good servant nor in a position to seek His forgiveness and bounties. I came across a beautiful lecture which just in few minutes says it all as to why and how we need to connect to Allah and establish and strengthened our relation with Him for we need Him to live happily in this world, and the hereafter. Shouldn't we say it is time to reconnect to Allah, if we haven't done it already?